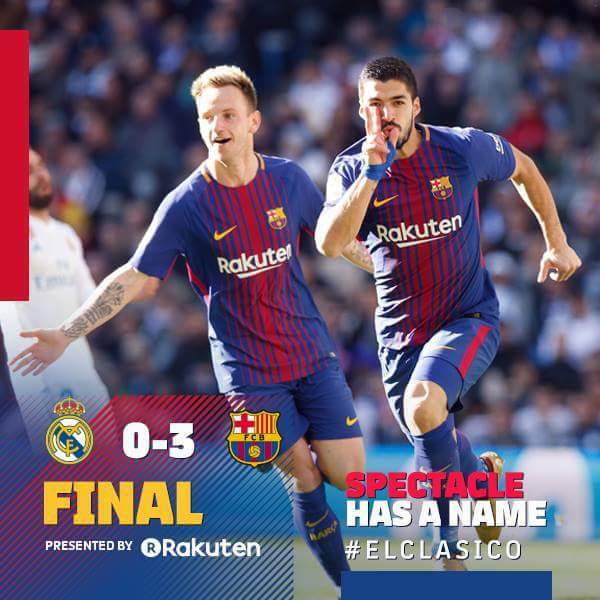 Barcelona struck a major blow in the LaLiga title race with a 3-0 win over Real Madrid in Saturday’s Clasico at the Santiago Bernabeu. Second-half goals from Luis Suarez, Lionel Messi and Aleix Vidal gave the Catalans a club-record third win in a row in a league match at the home of their fierce rivals and saw them move nine points clear of Atletico Madrid at the top of the table. Zinedine Zidane’s reigning champions, who had Dani Carvajal sent off for a deliberate handball just before Messi’s strike from the penalty spot, are now 14 points adrift of the leaders and, despite having played a game less, their title hopes appear to have been dealt a crushing blow. Madrid trounced Barca in the Supercopa de Espana in August but the latter have gone unbeaten since that two-legged tie in all competitions, and they seemed happy to frustrate the home side in the first half in the knowledge that the onus was on Madrid to chase the win. The hosts, who surprisingly matched Barca’s four-man midfield by starting Mateo Kovacic, saw Cristiano Ronaldo – passed fit after an injury scare this week – and Karim Benzema come closest to breaking the deadlock before Suarez struck nine minutes after half-time at the end of a slick move. Zidane prepared to bring on attacking reinforcements but the game was taken out of his hands when Carvajal was sent off and Messi swept home from the spot for his 17th LaLiga goal against Madrid, more than any other player in history has managed.